One of the mistakes we make is asking people in deep grief how we can help them. They are often too lost in their own sorrow to identify needs. It’s okay to ask; but just know you can step in and help. For instance, if it’s after the funeral at a reception and the trash needs to be taken out – don’t ask, just help. In the old days we would gather around the loved one and just do things for them. Bring over some food so that they don’t have to cook but can still eat well. You probably know their life—offer to pick up the kids, help them with their yard, offer to take them on errands. My audio lesson: Life’s Final Chapter: Making Peace with Death & Meeting the Needs of the Dying is an enlightening online lecture, I gave with my co-author with Elisabeth Kübler Ross, one of the world’s most renowned experts on grief and loss, I hope it helps you and your loved ones face life and death with peace, dignity, and courage. Whether you’ve always been afraid of death, know someone who is dying, are struggling with grief from losing someone in your life, or are facing your own mortality, it will bring you hope, comfort, and love to life's final chapter. Download it here FREE when you buy You Can Heal Your Heart, my book on grief with Louise Hay. At least she lived a long life, many people die young. Aren’t you over him yet, he has been dead for awhile now. You can have another child still. She was such a good person God wanted her to be with him. My favorite memory of your loved one is…. We all need help at times like this, I am here for you. I am usually up early or late, if you need anything. Saying nothing, just be with the person. Many of us have said “The Best” and “The Worst.” We meant no harm. In fact, we meant just the opposite. We were trying to comfort. A grieving person may say one of the worst ones about themselves and it’s okay. It may make sense for a member of the clergy to say, “He is in a better place” when someone comes to them for guidance; whereas an acquaintance saying it may not feel good. They want to fix the loss. They are about our discomfort. They are directive in nature. They rationalize or try to explain loss. Put a timeline on loss. They are supportive, but are not trying to fix it. They are nonactive, not telling anyone what to do. They are admitting that they can’t make it better. They are not asking for something or someone to change feelings. In the final analysis, one thing is clear to me: Life ends, but love is eternal. 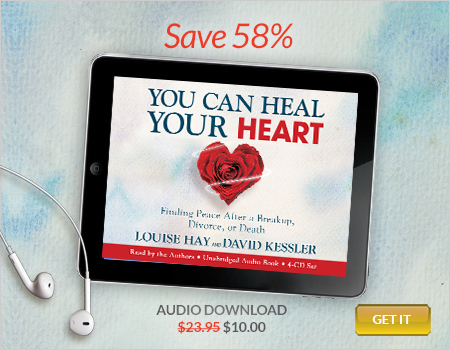 You can get my audio lesson: Life’s Final Chapter: Making Peace with Death & Meeting the Needs of the Dying FREE when you buy You Can Heal Your Heart, my book on grief with Louise Hay.